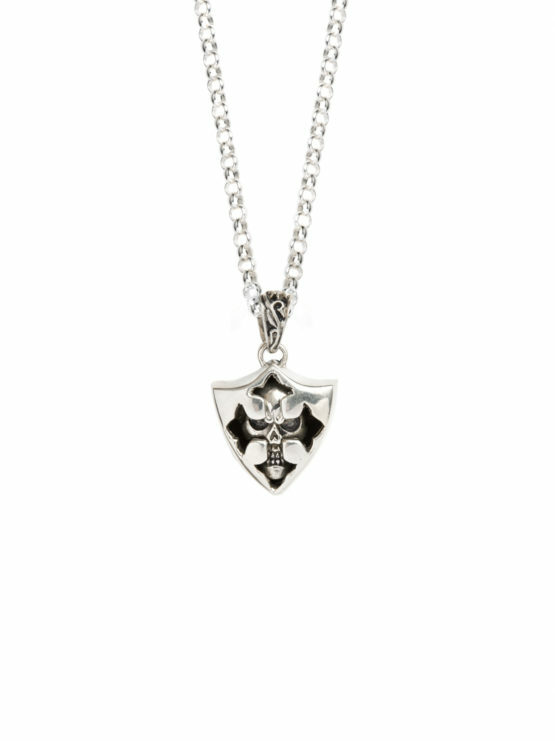 Channel your inner rock chick, with this gorgeous white bronze skull shield pendant, that measures 2.5cm in length and hangs on an 80cm chunky sterling silver belcher chain. A timeless and classic, gold plated Virgin Mary necklace to bring some spiritual calm to the hustle of modern life. Wear on its own or team with other charm necklaces for an on-trend, layered look. The gold plated, sterling silver ball chain is 60cms in length and the charm measures 2cm in diameter. Release the inner rock chick! This awesome solid sterling silver skull measures 2cm in length and hangs on an 80cm sterling silver ball chain. The perfect necklace to layer with other shorter ones. This is a necklace you will have forever and never want to take off! The solid sterling silver curb link chain measures 45cm in length, 1.3cm wide and has a wonderful chunky T-Bar clasp. It has a an amazing weight to it and you can be sure that it will become a friend for life. If this item is out of stock then please allow four-six weeks for production. Please also contact us if you wish to alter the length of the chain. This totally en trend necklace is made up of a bronze coin, measuring 2.5cm in length. The pendant has been cast from a 1930s Dutch guilder depicting Princess Wilhelmena. The sterling silver ball chain measures 80cm in length and has been plated in 23.5ct gold. Give a classic cut shirt an instant style makeover with a beautifully balanced pair of eye catching gold plated cufflinks. The perfect gift for him or for her! Each T-Bar measures 2.5cm in width and the connecting chain 2cm..